For a quick overview of the Commdeck installation process, please take a moment to view our short installation videos. Typical installation should include four Coax Cables with one ground wire. Homerun all of the wires from the Commdeck to the central power or video distribution point. Leave 6′ of extra cable at each end. Use a 1/4″ thread or larger toggle wing from a toggle bolt to install the wire into the Commdeck base while working from inside the attic space. In many cases this will eliminate the need to go onto the roof surface to pull cable into base unit. The toggle wing will hold the coax cable and ground wire in place and ready for the satellite dish or antenna installer to use. Toggle wings can be purchased in bulk from your local hardware supply store. View complete instructions with pictures (PDF). If you are pre-wiring for a system, you may want to home run a Smurf Tube (plastic flexible conduit) from the Commdeck to the central power location or video distribution center. 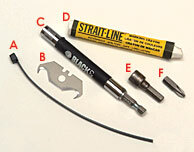 This will allow you to install or change wire as needed for any dish or antenna equipment you may want to use. Use tie wraps to keep your cable tight to the arm of the satellite. Use a hook blade on your utility knife to make cutting the shingles easier. Use a drill bit extension to reach top screws underneath shingles. 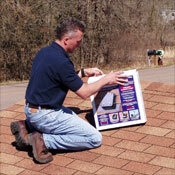 Use a white marking crayon for visibility on shingles. Use a 5/16” nut driver to place or remove tek screws in lid. Use a #2 Phillips drive bit when securing base to roof deck.